Renters, Fight off the Winter Chill – Central Electric Cooperative, Inc. According to the U.S. Census Bureau, 33 percent of Americans lease their homes. Unfortunately, many lease agreements forbid major alternations to rental properties. But don’t worry renters! Consider using these low-cost, energy-efficient tips from Central Electric Cooperative to improve the efficiency of your home this winter. During the winter months, take advantage of heat from sunlight. Open draperies and shades during the day to allow natural light to heat your home. Remember to close them in the evenings as the temperature drops and window panes become chilly. Does your home have window air conditioning units? This winter remember to insulate the units from the outside with a tight-fitting cover, available at your local home improvement center or hardware store. This keeps heated air from escaping outside. If desired, you can remove the window unit during winter months to prevent energy loss. Another way to save on heating is to make sure your water heater is set at the lowest comfortable setting. Have you experience scalding hot water when taking a shower? If so, it’s likely that your water heater is set took high-which is a waste of energy. Older models of water tanks are often not insulated, which can easily be remedied by covering them with an insulating jackets. Lighting is one of the easiest places to start saving energy, and savings are not strictly limited to winter months. Try replacing a few of your most frequently used light blubs with ENERGY STAR-qualified lights, and save more than $65 a year in energy costs. ENERGY STAR-qualified light emitting diode blubs (LEDs) use 75 to 90 percent less energy, respectively, and last several times longer than incandescent light blubs, saving money on energy bills and replacement costs. Practicing energy-efficient habits is another great way to reduce energy use. Always turn off your lights when leaving a room. Leasing an older home or apartment? 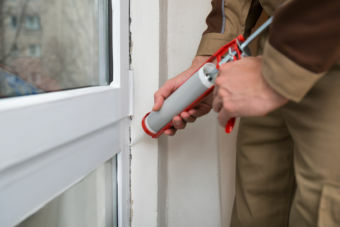 Odds are you have single-pane windows and old or missing caulk. Don’t let the winter chill seep indoors! Apply caulk around window frames, sashes and door panels to combat air leaks. Also, be mindful when using electronics at home. Unplug devices when not in use, and use smart power strips to save on energy use. To learn more ways to be energy efficient around the home, visit www.cec.coop.